Starring Cillian Murphy, Naomie Harris, Christopher Eccleston and Brendan Gleeson. Jim awakens from a coma to find London decimated by a deadly virus that has reduced its remaining inhabitants into a horde of rabid violent creatures. It’s safe to say that we’re entering the late stages of the ‘Golden Age of the Zombie’ with the shuffling flesh munchers having enjoyed an unprecedented period of popularity for the last few years, albeit one that is now in the midst of a decline thanks in part to a market oversaturated with bargain bin rubbish and a certain TV show overstaying its welcome by about 4 seasons. It wasn’t always like this. In fact, there was a time when the zombie genre was, well, dead. A genre dismissed by the mainstream and really only enjoyed by the few die-hard fans. While we often credit The Walking Dead for the current explosion of undead love, I would say that AMC’s small screen blockbuster was merely the culmination of a slow return to life. 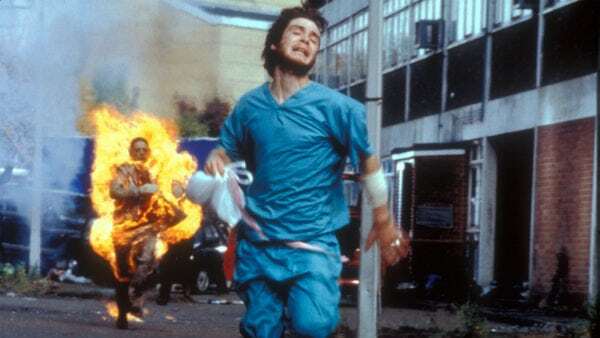 In my view, the film that deserves the credit for getting the zombies shuffling (or running) again is Danny Boyle’s terrifying 28 Days Later, one the greatest zombie films of all time and one of the best horror films of the last decade. Danny Boyle is a director who, in my view, very rarely makes a bad film with even his weaker efforts possessing more good qualities than bad. Boyle’s great talent is that he is seemingly able to tackle any project of any genre whether it be a drama, a comedy or even an Olympic opening ceremony and never lose sight of what really makes them special; the characters. 28 Days Later, Boyle’s first and, to date, only horror film keeps this trend going with the horror of the situation, while omnipresent throughout, being arguably secondary to the characters emotional arcs. The best example of this rich character development is easily Selena who, upon first impressions, is a cold and hardened warrior. One who has perfectly adapted to the new violent world around her because it’s the only way to stay alive. However, thanks to the characters she meets along the way, Jim in particular, she gradually begins to soften and allows herself to feel more than just anger and hatred, eventually coming to see others as real human beings she can rely on and care for instead just as another potential liability. It’s thanks primarily to Boyle’s direction (with some help from the script and the cast of course) that allows you to come to care for the characters and it also only adds to the pain and sadness when some of them inevitably meet a tragic and grisly end. Most zombie films use the onset of the apocalypse as some kind of social commentary, such as Dawn of the Dead using its zombies as a means to satirise consumerism. 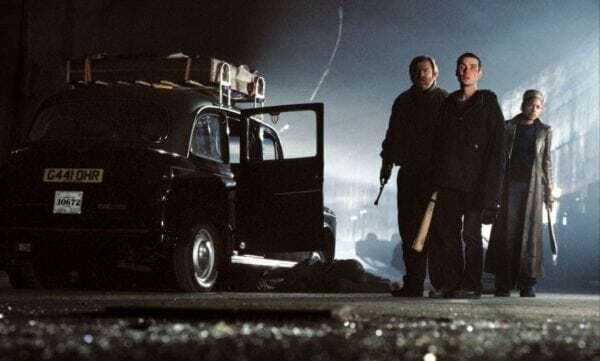 In the case of 28 Days Later, Boyle and writer Alex Garland use the zombie apocalypse as a means to tackle the violent nature of humanity itself, with the RAGE virus really being nothing more than a way of “kicking the door open” to the violent impulses that lurk within all of us. There’s a reason why the film opens on news footage of riots and hangings; it shows that we really didn’t need much a push to collapse into madness and murder. The arrival of the soldiers furthers this theme, with Major West (Christopher Eccleston) calmly stating that all he saw in the weeks before and after infection was “people killing people” and that the infection is simply a new addition to this long running trend. The soldiers also highlight it’s really the uninfected you have to be scared of. The infected can’t control their homicidal urges, but the soldiers can but simply choose to give in to their darker impulses because there are no societal rules governing their behaviour. 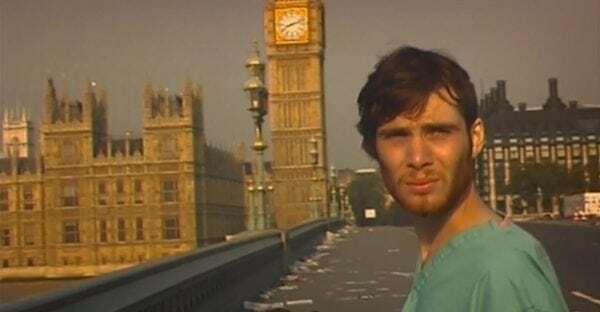 The richness of the characters and themes would be lost if given to actors who couldn’t handle them, fortunately however 28 Days Later boasts a fantastic cast who bring their best to the roles. Cillian Murphy excels at creating a true “everyman” protagonist whose rises from terrified onlooker to blood-soaked hero. Naomi Harris also excels as Selena, with the actress expertly navigating the gradual change from cold hardened fighter to a compassionate and caring heroine without it coming across as forced or clumsy. Props also have to be given to Brendan Gleeson (an actor who never fails you) as Frank, a loving man who becomes something of a surrogate father to his new travelling companions, with the veteran Irish actor crafting a character who quickly endears himself to the viewer. It also helps that Gleeson’s English accent is so pitch-perfect that you forget that he’s one of the most Irish people to ever walk the planet. In terms of what makes the film scary, it’s not the infected hordes (although they are frightening) but it’s the moments of quiet eerie stillness. The now iconic opening shots of a deserted London are terrifying not because of all the destruction, but simply because there is literally no one to be seen or heard. You don’t even have the joy of catching a drunk person accidentally stumbling into the shot or the sight of traffic in the distance. It’s just an eerie stillness with not a sound made apart from Jim’s desperate cries of “Hello!”. It’s these quiet moments that make the gruesome sight of corpses even more chilling and it really makes the infected attacks all the more intense and frightening as it’s often them who break the silence with their sheer ferocity. The quiet nature of the film is not limited to the horror of it’s setting, with this approach also allowing for some moments of solemnity such as the rather beautiful sequence in which Jim and co watch a group of horses running through a field accompanied by John Murphy’s haunting score. 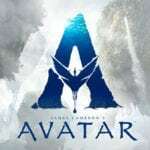 The film interestingly enough though has two endings (most TV airings of the film show both with one as a post-credit bonus). I honestly I prefer the alternate ending that I feel fits more in line with the overall bleak tone. I won’t reveal the endings for those yet to see the film but I’d love to hear which one you prefer dear readers. 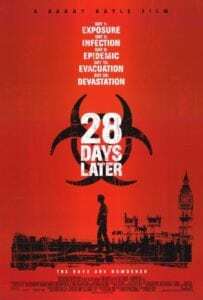 28 Days Later is a beautiful, gruesome and terrifying film that stands out amongst the hordes of by the numbers zombie flicks, mainly because it tries something different with the well-worn tropes. The focus is not on the zombies but on the well rounded and well acted characters. The real horror of the film lies not with the zombies but with the stillness of the desolation that they leave in their wake. In short, it’s one of the greatest zombie films ever made.